The passenger compartment remained stable during the impact. The steering column and steering wheel moved forward, creating more space for the driver dummy's head and chest. Dummy results showed that the knees and femur of the driver and passenger were well protected. Volvo were able to demonstrate that the car would provide similar levels of upper leg protection to occupants of different sizes and to those in different seating positions. The car scored maximum points for its performance in the side impact test. However, in the first pole test, the side airbags fired late which prevented the side curtain airbag from fully deploying, and the car was penalised. Volvo were dissatisfied with the performance of the car in that test and developed a fix for the airbag deployment problem. Euro NCAP agreed to a re-test on the condition that all cars were modified. Volvo have implemented the fix in all production vehicles and have recalled cars, telling owners to get their cars updated by their dealers. Unfortunately, the same problem occurred in the re-test and again the airbag failed to deploy correctly. The V70 scored maximum points for its protection of both the 18 month and the 3 year old, based on dummy readings from the frontal and side impact tests. The passenger airbag can be disconnected by a Volvo dealer, allowing a rearward facing child restraint to be usedin that seating position. The label warning of the dangers of doing so without first disabling the airbag was not clear. The presence of ISOFIX anchorages in the rear seats was not clearly marked. The bumper scores maximum points for its protection of pedestrians' legs and the bonnet provided predominantly fair protection to children's heads. However, the part of the bonnet likely to be struck by an adult's head provided predominantly poor protection, as did the front edge of the bonnet. Electronic Stability Control is standard across the model range, as is a seatbelt reminder system for the driver and front passenger seats. 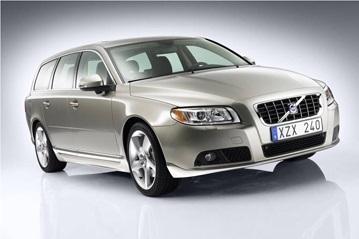 The Volvo V70 was originally assessed by Euro NCAP in 2007. Whiplash tests have been done to supplement the original test data, and the results have been calculated according to the new rating scheme requirements of 2009. There is no change to specification of the car or its safety equipment from the one tested in 2007.